You can apply the effect on your images if you drag and drop them here! The so called "Droste effect" refers to a picture that contains the picture itself. Within this embedded picture, the original picture occurs recursively. Some advertisements utilize this effect. It gets more exciting if the replicated picture is twisted as in M.C. Escher's famous lithograph "Print Gallery". In this artwork, a visitor sees a picture that ultimately contains himself. In 2002 the Dutch mathematicians Hendrik Lenstra and Bart de Smit investigated the image and laid a mathematical foundation for the twisted Droste effect. 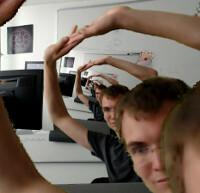 This website applies the Droste Effect in real-time to either uploaded images, the webcam stream (using the CindyJS software together with CindyGL). In their article, Saul Schleimer and Henry Segerman demonstrated how the (twisted) Droste effect could be applied to spherical images by utilizing the complex exponential, logarithm, and Möbius transformations. If you have a spherical camera (such as the Ricoh Theta), you can also try out this effect in real-time on this website. Matt Parker and Henry Segerman made an awesome demonstration of this effect in a YouTube-video.